Do you have a new book coming out? 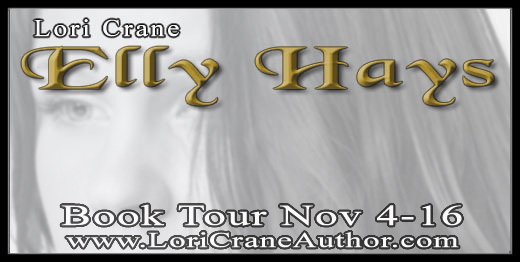 Try a virtual book tour. I actually fibbed a bit about the easy-as-pie part, but hey, nothing worth doing is ever easy, is it? Ask everyone you know who has a blog and has the kind of customers you could entertain. Don’t ask the guy who writes the auto repair blog to host your chick lit book. You don’t need a lot of blog hosts, only enough to fill a week or two – maybe eight or ten sites. Don’t bother blogging on weekends. Most people blog Monday through Friday. Fill in any holes with Release Parties on Facebook and Live Twitter Events. Prepare all of your blogs, interviews, excerpts, links, media kits, photos, etc., far in advance and keep them in a folder on your computer desk top. Write blogs on why you wrote the book, when and why you started writing, the era the story took place, even an interview your main character. To make it a little easier on yourself, schedule some blogs to simply be short snippets from the book, or even just the synopsis and your bio. Don’t forget to include buy links with every post!!!! Organize your schedule, along with host information, email addresses, etc. You need this all in one place. Excel spread sheet, anyone? Communication with your hosts is key. Keep all correspondence – Invitation, Response, Follow up, Confirmation, Reminder, and Final Thank You. You’re not being a pest. You’re simply making sure all your hosts are on the same page. You also need to communicate with your audience. I suggest posting the schedule and links on one page (maybe your website?) and direct everyone to that page to see the schedule. Don’t try to update six different sites. That’s too much work. The secret is to be WAY ahead of yourself. Give yourself at least two months, minimum, to plan. You have blogs to write, promotions to do, organizing and scheduling to accomplish. Don’t squeeze yourself into a corner and get stressed. Give away freebies to attract readers. You can offer eBooks, gift cards (Amazon will let you email them saving on postage), swag, or you can set up an account and do an official raffle. Rafflecopter is awesome. Rafflecopter allows you to give readers entries for specific actions like following you on Twitter, liking your Facebook page, signing up for your newsletter. Consider offering an end-of-tour Twitter Chat on one day for one hour with a specific hashtag. Announce it throughout the tour. Invite other authors in your genre to participate, so you can discuss your book with them if you have a roomful of lurkers but no tweeters. Have some crafty photo-shop-type person make you a banner announcing your tour and post it EVERYWHERE. Here are two I used. One matched my book cover, one matched my website. Notice I put my website as the landing point on both advertisements. That way, I only needed to update sites or links on that one page. When the tour is over, the hosts thanked, and the giveaways done, clean up your sites. Remove dates from your website and blog, but leave the posts and links up. They will continue to bring business for a long time. Promote Promote Promote – before – during – and after!!!!! 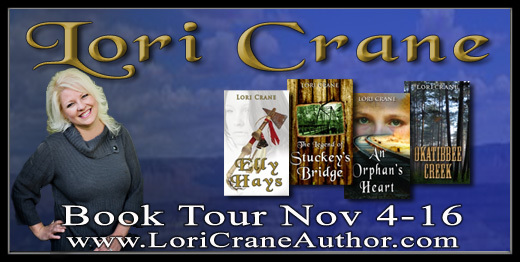 Lori Crane is a bestselling and award-winning author of historical fiction and the occasional thriller. Her books have climbed to the Kindle Top 100 lists many times, including “Elly Hays” which debuted at #1 in Native American stories. She has also enjoyed a place among her peers in the Top 100 historical fiction authors on Amazon, climbing to #23. She resides in greater Nashville and is a professional musician by night – an indie author by day. Thriller – In a thriller, the reader already knows whodunit and is merely along for the ride. If a story is about Jack the Ripper, the reader already knows what is going to happen and who is responsible, and in the story, the reader lives in the moment with either Jack or the one chasing him. If the story is told from the victim’s point of view, it could be categorized as Suspense (see below) because they know something is going to happen, but don’t know what it is. (One can usually recognize suspense by the ominous music in the background. LOL). Suspense – The reader knows something is going to happen and perhaps knows who will do the deed, but something is unknown. Either the character doesn’t know it’s coming, or the reader doesn’t know the specifics of what, when, who, or how and is turning pages to find out. The reader may witness a person setting a bomb with a timer, but the characters don’t know they’re about to get blown to smithereens in ten minutes. In the above example about Jack, the reader will know Jack is heading toward the victim, but the victim is oblivious, or the victim will know someone is chasing them, but they don’t know who it is. So, Jack’s story can be a Thriller or Suspense? Yes. Often the categories will overlap. If there are scenes of suspense where the victim doesn’t know what’s coming, it could be categorized as Thriller/Suspense. If Sherlock’s story revealed the killer to the reader in the beginning and Sherlock was simply chasing him, it could be Mystery/Thriller. Generally, if the work falls into more than one of the above categories, a writer should narrow it down to two. A work of Mystery/Thriller/Suspense will only get lost in the shuffle. Narrow it down as much as you can. Bottom line – Don’t fret too much about genre. If it’s a good story, readers will find it and buy it. It doesn’t matter what box the bookstore wants to put it in. The key to getting good reviews seems simple—write a good book. Not! Unfortunately, it’s not that easy. Not even accomplishing that great feat will ensure good reviews from the reading public. We’ve all heard the old adage, “Everybody’s a critic,” and we’ve all heard it because it’s true. People are eager to give you their opinions, whether you want to hear them or not. The primary key to getting positive opinions/reviews is to get your book to the right people…and keep the wrong people far, far away. The ‘right’ people are those who have a good chance of actually liking your book. The ‘wrong’ people are everyone else. Logical! But how do you do this? Be truthful. There is a market for every book, so don’t advertise your book to be something it’s not. If it’s a boring drama, say so. I love boring dramas and would buy it and probably give it a great review. Craft your synopsis as carefully as you create your cover. Good Cover = Book Sales! 5 easy steps! So, you’ve finished your awesome novel. You’ve toiled and fretted over each and every word, and your characters are now dancing through their scenes with grace and eloquence. Now what? It’s time to take off your author hat and replace it with your business hat. You want to sell your book, and to do that, you need great packaging. You need to create an interesting cover that will stick out above the millions of other books in the marketplace. Oreos don’t only sell because they’re awesome, they sell because the package tells you you like them. Next time you’re in the store, look at Oreos vs the no-name brand. You’ll see the difference immediately. The purpose of packaging is to get your potential customer to notice your book. Then to pick it up. If your name is Stephen King, you don’t need to worry about your cover. If not, you need all the help you can get! You don’t want just another pretty cover, you want the whole package—an incredible package that will sell your book. 1) Start with genre. Is your book historical fiction, medical drama, psychotic thriller? Check out the top books in your genre. Do they have a common element? Use it. You want people to be able to recognize your genre immediately. 2) What’s your demographic? 20-something urban or mature woman in the south? You need a cover that will appeal to this demographic. Even if your book is about a southern serial killer in Huntsville, Alabama, an image of a scary man wielding a knife over a dead girl is not going to appeal to a proper southern woman. Who are you trying to sell this book to? 3) Pretend you’re telling someone about your book. What are the scenes you’re relating? Those are the pictures you want to include, whether they are abstract or an actual photograph of a blonde girl in a 1950’s powder-blue dress. 4) What emotional response do you want from your customer when they’ve finished your book? Fear, tears, happiness, hopefulness? The girl in the blue dress can be any of those things if the image is manipulated correctly. Check with your cover designer for suggestions on how to change the same girl into a multitude of emotions. 5) The font. Does the book take place in Old England or 1940s art-deco New York? You want an appropriate font, and make sure it’s readable on the thumbnail-size postage stamp your customer will see on the Internet. A pretty font is not necessarily your friend. Note: If you are not an experienced graphic designer, hire a professional!!! You’ll still need to tell him/her what you want by using the five ideas above. If this is your first book cover, you need different covers for different items. Paperback, ebook, audiobook, etc. all require different sizes and elements. You’re cover designer will know how and where to find these requirements. I’m finishing up the final revisions of the fourth book in the Culpepper Saga, Culpepper’s Rebellion. In the first book of the series, John Culpepper struggles to realize his dreams, never seeing eye-to-eye with his father. His dad sends him to law school, and John hates every moment of it, wishing instead to own a ship and become a merchant between London and the colony of Virginia. In the second book, the English civil war breaks out, and John’s ship is the only lifeline that saves the family from certain execution. In the third book, John becomes the patriarch of the family, struggling to hold his family together on two continents. 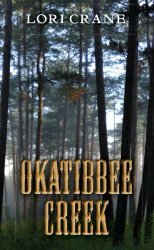 In this final book, John finds himself in the middle of Bacon’s Rebellion in Jamestown, Virginia. He is so wrapped up in the Jamestown drama, he doesn’t realize his youngest son is beginning his own rebellion in Carolina. When all is finally calming down in Virginia, John’s son is arrested in London on charges of treason. John’s law training, which he so desperately despised in his youth, becomes the only thing standing between his son’s life and death. Here’s the first chapter of the new book. 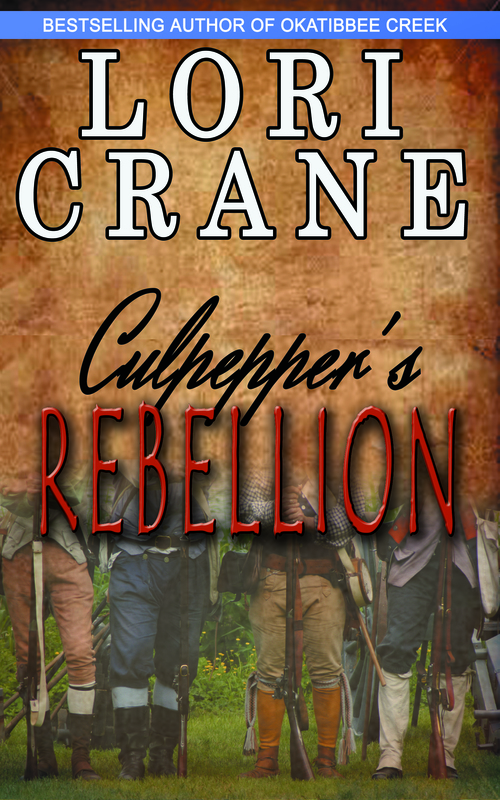 Culpepper’s Rebellion will be released October 31, 2015. John followed the guard down the winding hallway. It was narrow and dark with only the light of an occasional torch resting in its iron holder, flickering shadows on the stone walls. Where John could see, the walls looked dark and damp, covered with a slimy layer of green mold, but the musty smell didn’t mask the overwhelming stench of urine and feces. He shook his head and wrinkled his nose at the insult. As he passed intermittent arched doorways, prisoners yelled at him through small, bar-covered windows and pounded their fists on the wooden doors. Some begged for mercy, others pleaded for food and drink. The desperate voices echoing off the walls should have made John uneasy, but he only felt sheer hopelessness for those imprisoned. He didn’t look up when they called to him. He walked behind the guard with his head down, his heart heavy. How could any man endure this dreadful place? He remembered his older brother serving a short sentence within these walls during the civil war more than thirty years earlier, but in all of John’s seventy-four years, he had never seen the inside of the Tower. The unfortunate occasion that had brought him all the way from Virginia to be here on this day was more terrifying than the actual place. The guard slowed when he rounded the corner, reaching inside his tunic pocket and noisily producing a ring of iron keys. John waited while the man found the appropriate key and placed it in the keyhole. When he turned it, there was a loud metallic snap. The guard pushed open the door, which moaned softly on its rusted hinges, and John entered. The small room was lit by only a sliver of a window placed so high on the wall that none could see in or out. As the guard closed and locked the door behind him, John’s heart melted at the sight of the figure lying in a ball on a wooden platform, facing the moldy wall. John assumed the platform was a bed, but there was no blanket, no warmth, no comfort. A mouse scampered across John’s boot and disappeared into the tiniest of holes in the wall. At least the prisoners didn’t have to sleep on the floor with the mice. “They’ve charged me with treason.” He ran his fingers through his disheveled curls. The first three in the series are available at Amazon. After you read them, please stop by the Culpepper Saga Facebook page to see pictures, paintings, and documents from the real history of John Culpepper. The first thing you need to look at when considering making an audiobook are the numbers. The Audio Publishers Association reported $800 million in audiobook sales in 2011. The number grew to $1 billion in 2012 and $1.2 billion in 2013. Yes, that’s billion, with a B. Goodereader.com said the audiobook industry was worth over $2 billion in 2014. I haven’t seen any numbers for 2015 yet, but there should be a little bit in there for you. Now that I have your attention, let’s create an audiobook. The process of creating an audiobook is completely painless at ACX. This post isn’t a commercial for ACX, but I’ve used them a couple times now, and they are author-friendly. ACX (Audiobook Creation Exchange) is the company that links authors with narrators and distributes to Audible, Amazon, and iTunes. Your first step in creating an audiobook is to create an account at ACX.com, and then you can listen to some narrators by gender, accent, and style. Once you’re ready to go, you need to hire a narrator. You can narrate yourself, but it you don’t have recording equipment and lots of practice in front of a mic or lots of money to spend in a recording studio, it is a million times easier and faster to hire a professional. To find the perfect narrator, just upload a section of your book to ACX and invite auditions. Of course, you can email the actors you listened to when you first signed on. Make sure your uploaded section contains some dialog and maybe some drama in it. You want to hear the range of the narrator. Be ready to move forward quickly because you’ll get auditions almost immediately. Send each narrator a note of thanks for taking the time to audition your sample – whether you hire them or not. It takes a lot of time to record, master, and upload your sample, and they’re doing it for FREE. Once you choose a narrator, you then offer them a deal. Narrators charge anywhere from $100 to $300 per finished hour. This is called a “pay-for-production” deal. Example: If you’re book is 50k words, that’s about 6 hours finished, so the finished cost will be between $600 and $1800. Some narrators opt to do a 50/50 “royalty-share” instead. That’s 50% of your royalties for 10 years with no money up front. Take a moment and do the math so you know how many audiobooks you need to sell to break even. ACX sets your price by the length, and the above 6-hour book example would sell for roughly $19.95. The longer the book, the higher the selling price. The shorter, the lower. Read further to find out your share. The range of Audible pricing is 1-3 hours $7-10, 3-5 hours $10-20, 5-10 hours $15-25, 10-20 hours $20-30. Here’s another fun fact: If your book is purchased by a new Audible member as their first download, you get a $50 bounty. That’s fun! ACX will offer you two distribution options. 1) 40% royalties for an exclusive distribution deal. This is a seven-year contract and you are not allowed to sell the audiobooks yourself to anyone at any time through any avenue in any format (digital, CD, audio tape) during that time. OR 2) 25% royalties for an non-exclusive deal, and you can sell them anywhere you want. ACX distributes to Audible, Amazon, and iTunes, so I don’t know where else you’d want to sell them, unless you want to have them pressed and sell them out of your trunk. But keep in mind, according to the Audio Publishers Association, audiobooks that were downloaded through a website instead of bought on CD in 2009 were 29%, 36% in 2010, and 46% in 2011, and growing, so there may not be any good reason to press your audiobook. If your narrator costs $250 per finished hour and your book is 6 hours long, it will cost you $1500 for a pay-for-production deal. If you go with exclusive distribution and are making 40% of the $19.95 sale price, you would need to sell a couple hundred copies to break even. One note here: Audible members which are a huge chunk of your sales pay about half price, so your royalty income and break even number would need to be adjusted for those sales. You’d need to sell about 400 copies to only Audible members to break even. A majority of buyers on Audible are members. If you choose the “royalty share” option with your narrator, you would NOT need to pay the $1500 up front, but you would split the royalties 50/50 and only make $4 per copy sold for the next 10 years, and $2 for an Audible member sale. So, figure out how long your book will be (roughly 8500 words per finished hour) and how many copies you need to sell before you step up to the plate and ask for auditions and negotiate fees. Once you decide on your narrator, make a price/payment deal with them, and choose your ACX distribution option, you’ll need to upload your entire book and give the narrator some deadlines. There will be two deadlines: one for your narrator to upload the first 15 minutes for you to approve and one for the whole project to be completed. If your narrator isn’t too busy, they can have the first 15 minutes to you within a few days and the book completed within a month. They will upload each chapter to ACX as it is recorded, so you can listen to each chapter as it is uploaded and send a message to correct anything you’d like corrected. Be specific about the pronunciation of any strange names or titles up front in the process to avoid later corrections. 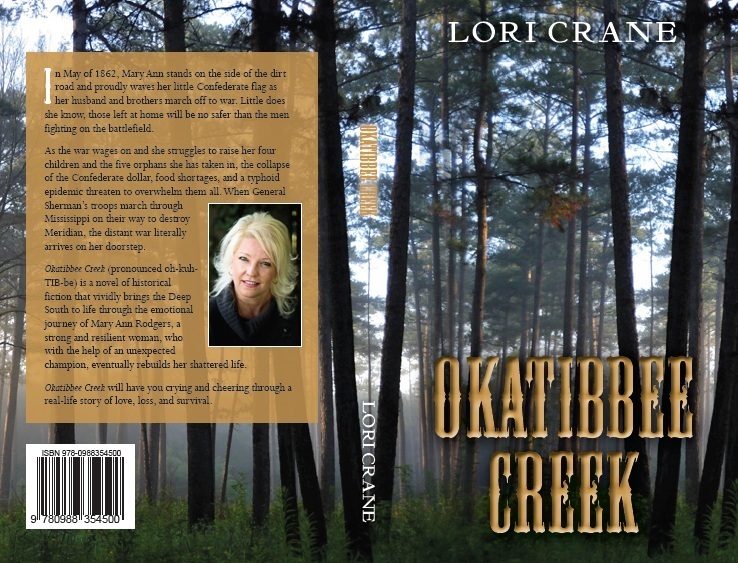 My book Okatibbee Creek is pronounced Oh-kuh-TIB-bee. That makes it easier. When the recording is finished and all chapters are uploaded, you’ll need to approve the recording. Your narrator will then send you a bill if you opted for the pay-for-production deal. If you opted for the royalty-share deal, this step will be omitted. Once you pay your narrator, he/she will let ACX know your audiobook is approved for sale. ACX will then take 2-3 weeks to get your audiobook live on the sites. So, the whole process should take about eight weeks. If you opt for a pay-for-production deal, save your pennies first. Do not make the narrator wait to get paid. The size of your cover needs to be adjusted for an audiobook to a square CD shape. You cannot use your ebook cover. 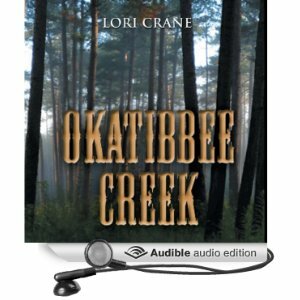 Here’s the original ebook cover for Okatibbee Creek and the resized audiobook cover. The needed dimensions can be found on the ACX website. I don’t know if they always do it, but Audible sent me 25 free download codes to give away. For the above example 6-hour book, that’s $500 worth of freebies, so while you’re waiting for your project to be completed, think of some creative ways to market and give those copies away. Some authors swear by audiobook sales. Give it a shot! 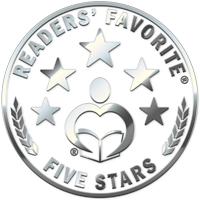 John Culpepper the Merchant just received a 5-star review from Readers’ Favorite!! You can read it HERE. I can’t tell you how much reviews mean to us indie authors…especially good reviews. We often learn something from the bad reviews, but mostly not. Good reviews sell books. Period. So for every book you like by ANY author, please leave a review. We all appreciate it. Anyway…back to the matter at hand. 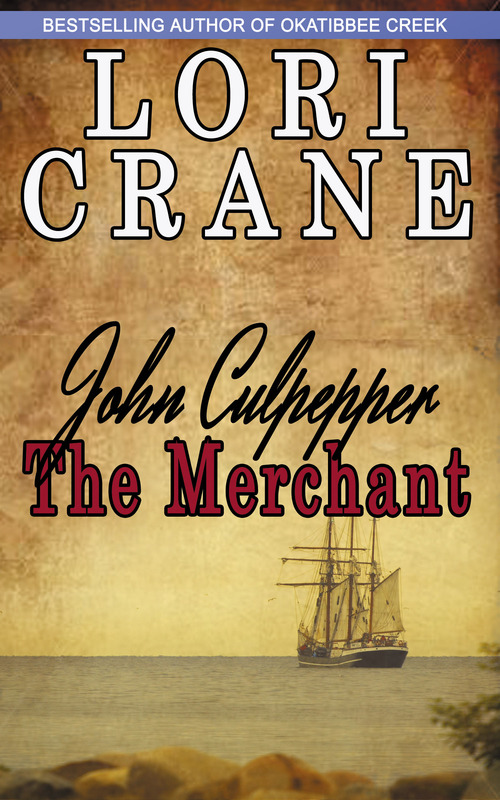 John Culpepper the Merchant is the second book in the Culpepper Saga. The first book is about John’s childhood. In this one, he’s all grown up. His family remains in England while he fulfills his childhood dream of sailing back and forth between London and Virginia. Seems peachy, yes? I’m sure it would have been if the king wouldn’t have been angering the masses. A deadly civil war breaks out in England, and John always seems to be on the wrong side of the ocean at the wrong time. By the end of the war when the royalists (yes, John’s family) have been defeated, John’s ship becomes the only lifeline to save the Culpeppers from certain beheading. Somehow, between the war and the merchant business, John and his wife managed to raise a family. Here’s a snippet of John taking his four boys upstairs to meet their newborn brother. Following a hearty breakfast, John climbed the stairs, followed by his rambunctious sons, all wanting to see the new baby. He cracked the door open and found Mary sitting up in bed holding the newborn, her brown hair cascading over her shoulders. Her color was much better after a good night’s sleep. “Your sons want to see the baby,” John whispered almost apologetically. John opened the door and the group ran toward the bed. Mary grinned at them and patted the bed for Robbie to climb up. John thought his wife was a saint, or at least had the patience of one. All the boys looked like their father, but none more so than the new baby. The boys cooed over the infant, and John reminded them repeatedly to keep their voices down. It was a wasted request. “He looks like you!” Denny exclaimed, looking at Henry. “What are you saying? That I look like a baby?” Henry challenged. The baby scrunched up his face at the sound of the voices. Henry punched him in the arm and James punched back. “You’re handsome,” teased Denny, punching James in the arm. “No, you’re handsome,” James punched back. “All right, let’s go and let your mother rest.” John picked up Robbie and coaxed the rest of the herd toward the door. Denny and James began poking each other. John handed three-year-old Robbie to Henry and grabbed both misbehavers by their hair. “Ouch,” they squealed in unison. “Acting like what?” Denny said in defiance. “Well…boys. Stop acting like boys.” John laughed at his own lack of parenting skills. Four years of law school, a momentary career as a lawyer, and a decade of commanding a boisterous crew on a merchant ship were no preparation for raising high-spirited boys. He thought about it for a moment and realized that besides his younger sister Frances, who was now a thirty-six-year-old married woman, he had always been the youngest of his generation. He’d never had any younger brothers or cousins to mind. One thing was for certain—Mary had her hands full during John’s lengthy absences, and he suddenly understood why she often pleaded with him to remain home for longer stretches of time. He was exhausted and it was only nine o’clock in the morning. 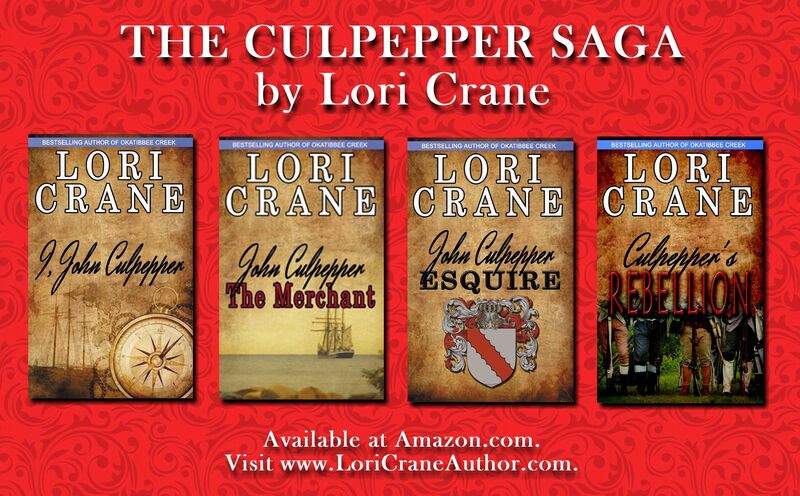 The first three books in the Culpepper Saga are available at Amazon. The fourth book will be released October 2015.